Astronomy lovers and people who just like “far out” things, this is for you! The Modine-Benstead Observatory is hosing one of its Open House Racine County events Saturday night, April 26th for free exploration of the observatory and the stars and planets its telescopes gaze upon. Seriously, you can just go in for free and look at the universe through their telescopes. Depending on conditions, you can check out the moon, planets, and many deep sky objects. If they’re deep enough, remember that you’re actually looking back in time. For example, when you view the Andromeda galaxy, you are looking back in time 2.9 million years. Trippy, man! These public open house events are held monthly from April through October. Parking is free along with free admission. 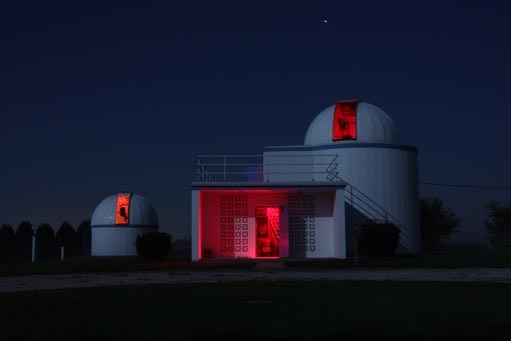 The Racine Astrological Society, which runs the whole thing, is a non-profit, volunteer-run organization and of course small donations are welcomed to help defray the yearly costs of observatory maintenance and care. While families are welcome, be sure to keep young children close (it’s a dark area, since the grounds are not illuminated to promote better observing) and instruct them to be careful with the telescope equipment, which is provided by RAS members. Note that there may be lines to make observations through some telescopes. Questions are expected and welcomed, since part of their club mission is to educate and inspire people to participate in the world of amateur astronomy. Astronomical equipment you’ll find at the RAS observatory will range from a few hundred to several thousand dollars in value.The night of an open house there will be a message on the observatory answering machine (262-878-2774) if the skies are too cloudy. The Modine-Benstead Observatory is located at the intersection of County Highway A & 63rd Drive in Yorkville, less than a mile south of Highway 20, a little over a mile east of U.S. 45, and less than 3 miles west of I-41/94 (take Exit 333/Highway 20 west.) It’s recommend that you dress warmer than you think is needed, since on clear nights the daytime temperature drops quickly… especially in April!